Helping the most impoverished children within our communities. Here, Past President Prue Willday is seen with members of St Ives Explorer Scouts who provided refreshments for participants on our annual community Sponsored Walk. 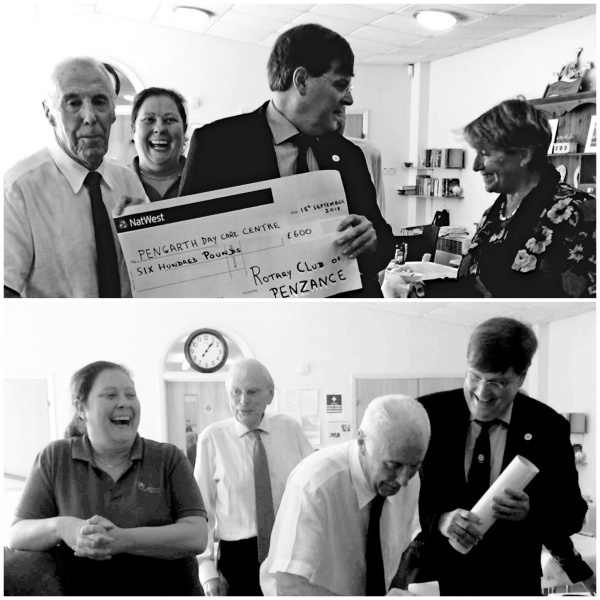 that the centre provides for the elderly people of Penzance and West Penwith. Pengarth Day Centre Trustee, Mr Eric Parton. 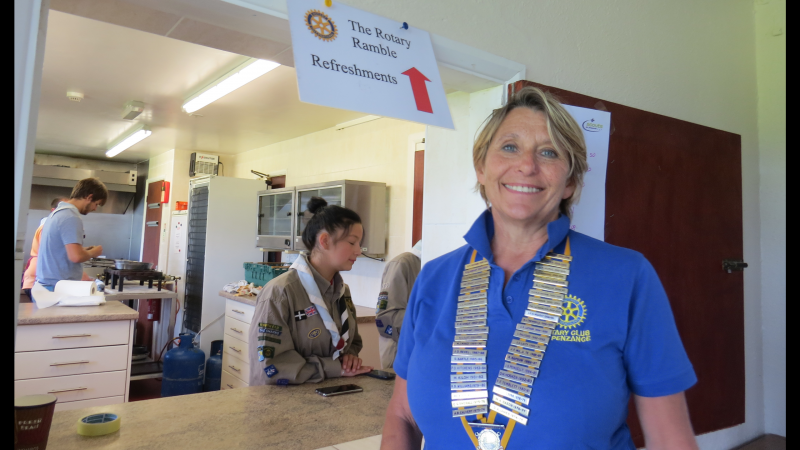 The Rotary Club of Penzance was established in 1923 and true to it's ninety five year history, the Club continues to organise a wide range of community and fundraising activities. The Club organises the town's annual Firework Display, regular Memory Cafe's for dementia sufferers, driving for the elderly, 'Know Your Blood Pressure' days in the town centre and recently a Vintage and Classic Car Show on Penzance Promenade. The 2017 Rotary Ramble took place as usual on the final Sunday in September. Over 150 people took part in the event organised by Penzance Rotarians. With and entry fee of just £2, the sponsored walk is aimed at youngsters as well as adults to encourage support for community organisations and charities. This year over twenty separate good causes benefitted from a share of over £8,300 raised by the sponsored walkers. Have you considered joining Rotary? You will make lifelong friends and at the same time you will help us to make a difference in communities near and far. We are ordinary people with a track record of achievement. Working together, donating time, skills, experience and fundraising for communities everywhere. The Rotary Club of Penzance, the most westerly in mainland England & Wales, draws membership from Penzance and West Penwith. The club is always on the look for new members - women or men, working or recently retired, usually with leadership experience from their business or community work. Rotarians volunteer a little of their time, talents & resources to address community needs. Rotary Clubs mobilise members and with community support reach their goals. New members enjoy new friendships, bring new energy and fresh ideas and help the Club achieve much more. End Polio - Donate now! Rotary's priority project internationally is the eradication of polio. In 1985 Rotary launched PolioPlus, a multi-million dollar initiative to immunise all the world's children against polio. Since then more than two billion children have received the oral polio vaccine. Rotary announces $35 million in grants to support the global effort to end polio. In 2015, the world saw historic progress against the paralysing disease, with just two countries – Afghanistan and Pakistan – reporting a single strain of the wild virus. If the current momentum is strengthened, this year may mark the last case of wild poliovirus.